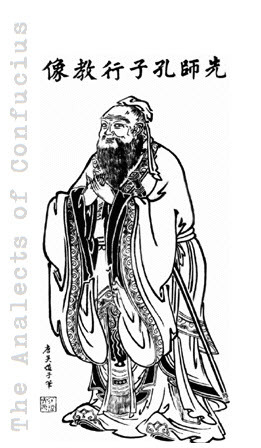 This is Book 11 of the Analects of Confucius. Master, "are plain countrymen; after them, the men of higher standing. If I had to employ any of them, I should stand by the former." Ts'ai States, not one now is left to approach my door." When Ki K'ang inquired which of the disciples were fond of learning, Confucius answered him, "There was one Yen Hw�i who was fond of it; but unfortunately his allotted time was short, and he died; and now his like is not to be found." On the same occasion, his wailing for that disciple becoming excessive, those who were about him said, "Sir, this is too much! "�"Too much?" said he; "if I am not to do so for him, then�for whom else?" "There is Yu's harpsichord," exclaimed the Master�"what is it doing at my door?" On seeing, however, some disrespect shown to him by the other disciples, he added, "Yu has got as far as the top of the hall; only he has not yet entered the house." Tsz-kung asked which was the worthier of the two�Tsz-chang or Tsz-hi�. "The former," answered the Master, "goes beyond the mark; the latter falls short of it." Characteristics of four disciples:�Tsz-k�u was simple-minded; Tsang Si, a dullard; Tsz-chang, full of airs; Tsz-lu, rough. "As to Hw�i," said the Master, "he comes near to perfection, while frequently in great want. Tsz-kung does not submit to the appointments of Heaven; and yet his goods are increased;�he is often successful in his calculations." Tsz-lu�first to speak�at once answered, "Give me a State of large size and armament, hemmed in and hampered by other larger States, the population augmented by armies and regiments, causing a dearth in it of food of all kinds; give me charge of that State, and in three years' time I should make a brave country of it, and let it know its place." This disciple was strumming on his harpsichord, but now the twanging ceased, he turned from the instrument, rose to his feet, and answered thus: "Something different from the choice of these three." "What harm?" said the Master; "I want each one of you to tell me what his heart is set upon." "Well, then," said he, "give me�in the latter part of spring�dressed in full spring-tide attire�in company with five or six young fellows of twenty,  or six or seven lads under that age, to do the ablutions in the I stream, enjoy a breeze in the rain-dance,  and finish up with songs on the road home." The three other disciples having gone out, leaving Tsang Sin behind, the latter said, "What think you of the answers of those three? "�"Well, each told me what was uppermost in his mind," said the Master;�"simply that." "But Yen, then�he had a State in view, had he not?"